The harsh Soviet winter of 1941 saw temperatures drop as low as -40 degrees Fahrenheit, a temperature at which human skin freezes in minutes. Axis and Allied forces alike suffered tremendous casualties due to the extreme cold. Relic Entertainment harnesses this deadly force of nature with Company of Heroes 2's ColdTech system. 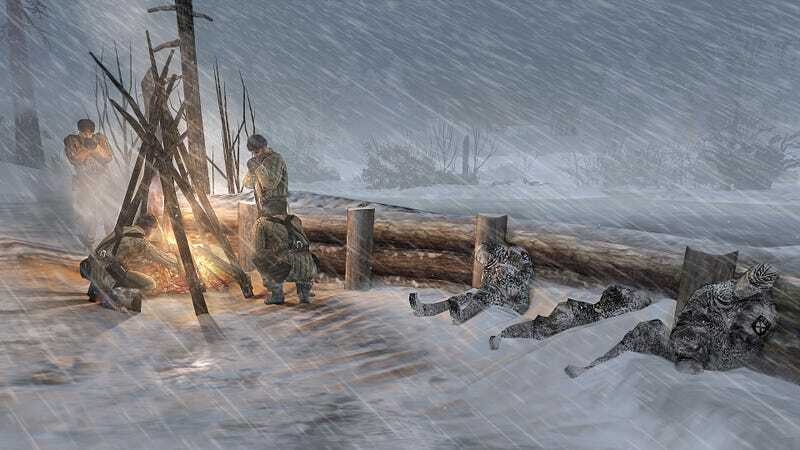 We've seen how fire and ice can affect the environments of Company of Heroes 2, dynamically shifting, reacting to troop movements, vehicles and direct interaction. What we haven't seen is how it affects the troops. Bundled in threadbare clothing and the odd furry hat, it'll take a smart commander to keep his forces from becoming frozen meat beneath a snow drift. On cold maps players will have to situate their infantry near fire or garrison them in buildings while not fighting in order to avoid death's icy grip. As can be seen in the screenshot above, just standing near the fire won't cut it. The wise general can also use the ice and snow to his or her advantage. For example, see those tanks slowly creeping across the ice? Now you don't. And what about those snipers? What snipers? This amount of interaction between the player and environment isn't something you see often in a strategy title. It's as if every battle will feature an additional faction, one that does not care who lives and who dies. Company of Heroes 2 is heading to the PC in early 2013. I'd bundle up.